The Tatung Einstein has characteristics very near those of the MSX machines (same video modes, same sound chip, sprites, etc.) but is not compatible with this standard. It was built in the UK at Tatung's plant in Telford in Shropshire. The Einstein runs under Xtal/DOS which is an operating system compatible with CP/M. It was possible to connect an other floppy disk drive and a 80 column card was available. The Einstein was a very attractive computer but it was too expensive to have great market success. Pretty much every 8-bit development house in the NW of the UK was using these machines in the late '80s, we'd develop for Atari, C64, ZX, Amstrad, MSX, C16, you name it. Superb keyboard, and the power-supply was so stable that you could quickly flick the switch off and on without the machine even noticing. No mains spikes could ever interrupt these things. I even wrote / sold a couple of games on it natively, they did ok. We mainly used them with 5.25 inch disks though, since the 3-inch disks it used weren't so reliable if you were writing to them continuously. The 256MB silicon-drive was a must-have.Doomed to be for hobbyists / developers only though, since it had no mass market appeal at the price / performance. 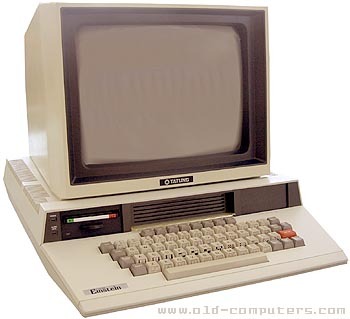 This computer at the time was a programmers dream, the operating system was easy to reprogram, and an excellent MOS (Machine operating system) mode meant that disk sectors or tracks could be easily loaded into memory, edited, then written back. Because of this, they were used to develop disk copy protection for the up and coming next generation Amiga and Atari ST. There was a nifty assembler specially written that we used to use at Elite Systems for programming the ZX Spectrum games - enabling you to write and assemble Z80 code, then download to the Spectrum via interface I (F5 I think it was :-)) - if your buggy code crashed, you could simply re-boot the Spectrum and debug on the Einstein. see more Tatung EINSTEIN TC-01 Ebay auctions !